The Data Management Command button contains a list of frequently used commands. Selecting a command prompts you for parameters and then adds the command to the script area. Manually click the Play button to run the commands in the script area. Use a scheduling program to automatically run the scripts as needed. Warning! TT recommends that no more than 1000 archived files exist in the <rootdrive>:ttdatfilesfmdssafe folder. Archive files must be consolidated on a periodic basis in order to maintain fast response times to X_STUDY requests. Warning! Because running a script automatically stops the responder, you should do so during non-trading hours. By default, saved scripts are found in the <rootdrive>:ttconfig folder and have a .fms extension. FMDS requires consolidation of archive files on a weekly or monthly schedule. TT has observed degradation of X_STUDY response times once archive file counts exceed 1,400 archive files. TT strongly recommends FMDS administrators consolidate archives before the file count is greater than 1,000 archives. Please note, if a weekly consolidation is setup and 52 archives are created a year, FMDS has the ability to achieve over 19 years of history before reaching the 1,000 archive limit. For more information on archive consolidation, refer to Consolidating Your Archives. 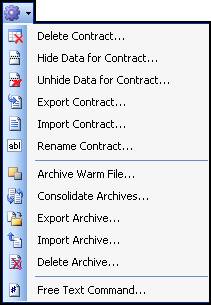 The options displayed below show the different archive commands you can create using the FMDS Data Management window. Tip: TT recommends you consolidate your archives once a week. Because performing any of these procedures stops the responder, you should run the commands during non-trading hours. Further, before you run any of these procedures, you need to backup your datfiles directory. Navigate to the <rootdrive>:tt folder. Right-click the datfiles folder and click copy. Navigate to a new location to save the datfiles folder. Right-click the new location and click paste. You have successfully backed up the datfiles directory. You should archive your Warm file before consolidating the archive files. Before you archive your Warm file, you must backup your datfiles directory. This flushes all data into archive files and allows for clean periodic data files, refer to Backing Up the Datfiles Directory. The Warm file contains the latest information you have received. So, once you archive it and consolidate your archives, you will have one file containing all the data for the products you recorded since the last consolidation. Because archiving your Warm file automatically stops the responder, you should run the command off trading hours. Click the button and click Archive Warm File. The Archive Warm File command appears in the script area. You successfully created a Warm file command. Note: If you want to save your command as a .fms file, click . Follow the steps above to create an Archive Warm File command. You successfully archived your Warm file. FMDS requires consolidation of archive files on a weekly or monthly schedule. TT has observed degradation of X_STUDY response times once archive file counts exceed 1,400 archive files. TT strongly recommends FMDS administrators consolidate archives before the file count is greater than 1,000 archives. Please note, if a weekly consolidation is setup and 52 archives are created a year, FMDS has the ability to achieve over 19 years of history before reaching the 1,000 archive limit. For more information on archive consolidation, contact your Technical Account Manager. You should consolidate your archives periodically. Because consolidating your archives automatically stops the responder, you should run the command off trading hours. The Warm file contains the latest information you have received. So, once you archive it and consolidate your archives, you will have one file containing all the data for the products you recorded during the week. Click the button and click Consolidate Archives. The Consolidate Archives window appears. 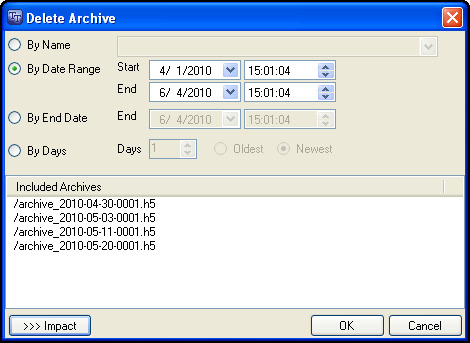 By default, you can set the archives to consolidate based on a Start and End date and time. 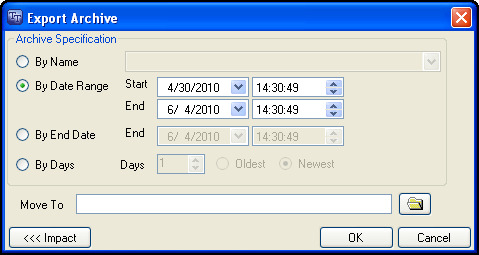 Alternatively, you can consolidate everything up until a specific End date and time. Note: The Impact button expands the window to show the archive files included in the archive you are about to create. The Consolidate Archive command appears in the script area. You successfully successfully created a Consolidate Archive command. Follow the steps above to create a Consolidate Archive command. You successfully successfully consolidated your archives. Before you export your archives, follow the procedures under Backing Up the Datfiles Directory. Exporting your archives removes all data stored in the archive from FMDS. Once this data is exported, FMDS will not have access to it unless the data is imported using the import command. Because exporting your archives automatically stops the responder, you should run the command off trading hours. When you export, you are telling FMDS to remove the data you have collected from FMDS and its metadata files. Warning! Do not manually remove archives from the FMDSSafe folder. Doing so will corrupt metadata files FMDS uses. This is why you must use the export or delete commands. Click the button and click Export Archive. The Export Archive window appears. Choose one of the several options to specify the archives files you want to export. In the Move To field, browse to the directory to which you want to move your archive. Note: The Impact button expands the window to show the archive files included in the export you are about to create. The Export Archive command appears in the script area. You successfully created an Export Archive command. Follow the steps above to create an Export Archive command. You successfully exported your archives. Before you import your archives, follow the procedures under Backing Up the Datfiles Directory. Importing your archives gives FMDS access to data previously exported from an FMDS server. Because Importing your archives automatically stops the responder, you should run the command off trading hours. When you import, you are telling FMDS to move the data you previously exported back into FMDS updating its metadata files. Warning! Do not manually add archives to the FMDSSafe folder. Doing so will corrupt metadata files FMDS uses. This is why you must use the import command. Click the button and click Import Archive. The Import Archive window appears. In the Import field, browse to the directory from which you want to import your archive. The Import Archive command appears in the script area. You successfully created an Import Archive command. Follow the steps above to create an Import Archive command. You successfully imported your archives. Before you delete your archives, follow the procedures under Backing Up the Datfiles Directory. You can choose to delete archive files you previously created. Because deleting your archives automatically stops the responder, you should run the command off trading hours. Click the button and click Delete Archive. The Delete Archive window appears. Choose one of the several options to specify the archives files you want to delete. Note: The Impact button expands the window to show the archive files included in the delete script you are about to create. The Delete Archive command appears in the script area. You successfully created a Delete Archive command. Follow the steps above to create a Delete Archive command. You successfully deleted your archives.